One simply description of Sonoma Coast State park might go something like this: a collection of coastal parks spread across a jagged coastline composed of headlands, crags, coves, and sandy beaches. This is true but it also misses so much. For instance it does not mention the rough nature of the Pacific Ocean and the rock formations that protrude from it. It also leave out the humility and wonder you feel as you drive along Highway 1, gazing out across the expansive ocean and seeing it merge with the sky at the horizon. And it leaves out what it is like to experience a day that begins with your sense of space being squashed by an enveloping fog and then having this burn off and give way to a picture perfect summer afternoon. The park is a beautiful place to visit and the experience you can have there will be better than any brief description can convey. Sonoma Coast State Park is made up of sections that are found along 17 miles of coastline that extends from Vista Point, which is just a few miles north of the town of Jenner, south to Bodega Point. There are over a dozen locations you can stop at as you cruise along Highway 1. You can take a lot in, and have a very easy day of sightseeing, by just driving the coast and visiting some highway pull offs. Almost every parking area provides easy access to views that include parts of the same set of elements: the Pacific Ocean, prominent rocky sea stacks, the shore, crags, and headlands. The variation that each of the elements can display, the way they can be combined in different ways, and even the light at different times of the day gives you a different sense of Sonoma Coast State Park at each stop. There are also some easy to traverse paths and walkways that provide great viewpoints and provide you with an oppotunity to stretch your legs. If you are feeling more adventurous there are hikes that traverse headlands or lead down to secluded beaches and coves. It can be helpful to make some preliminary decisions about what you want to see and do before you visit Sonoma Coast State Park. Some things to consider in this planning ........It is easy to linger longer than you think you might at any single stop, whether you just want to take in the views or you plan on walking around on the beach. If you are thinking about staying overnight during a summer weekend you will need to have reservations, whether you want to camp in the park or stay at a place outside the park. Also realize that the coast can cold, foggy, and wet even in the middle of the summer. Plan accordingly. 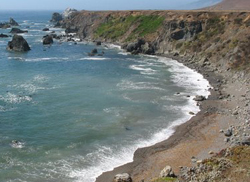 Camping - There are four camping areas in Sonoma Coast State Park. Bodega Dunes Campground is the campground with the most amenities. It has bathrooms and showers. There are no RV hookups but there is a dump station. Wright's Beach Campground is a little less fancy. There are bathrooms but no on-site showers. Willow Creek Campground and Pomo Canyon Campground are what the state of California calls "Environmental Camps." These are primitive camping areas - there are walk in sites with few amenities (picnic table, fire ring, and pit toilets) . The Beaches - First, if you are not aware (the following is from the Sonoma Coast State Park website): "This coast is not for swimming, and lifeguard service is not provided. Sleeper waves, backwash, sudden drop-offs, rip currents and the cold water, make even surf play or climbing on nearby rock outcroppings dangerous. It is especially important to keep children back from the highest water-line and never turn your back to the ocean. Many rescues are made each year. Also be careful of the bluffs and rocks. The shale formations are unstable and unsafe for climbing, so stay on the trails and heed warning signs." With those warnings out of the way, there are a number of beaches that you can either walk or drive to. These include (from south to north, see the Sonoma Coast State Park map) South Salmon Beach, North Salmon Beach, Schoolhouse Beach, Portuguese Beach, Duncan's Landing, Shell Beach, Blind Beach, and Goat Rock Beach. Hiking - There are three areas of the park that offer hiking opportunities. Most of the hikes along the headlands are not that strenous as you are walking across fairly flat ground that is essentially an open prairie. 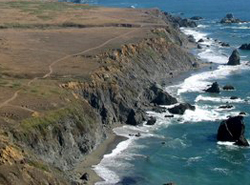 Bodega Head has a relatively short hiking trail that goes around the headland. This trail has spectacular views of the Pacific Ocean, Bodega Harbor, and the town of Bodega Bay. There is another trail that connects with the trail system found in the Bodega Dunes section of the park. Here you can walk along the headlands and on the beach. Further north in Sonoma Coast State Park are two other trails. The Kortum Trail extends from Blind Beach to Wright's Beach. Access (parking) is midway along the trail at Shell Beach at Wright's Beach. The trail travels along headlands and down to a few beaches. You can also travel inland from Shell Beach by taking the Pomo Canyon Trail. It begins at Route 1, just across the pull-off entrance to Shell Beach and ends at Pomo Canyon Environmental Camp. The final trail of note is at the northern edge of the park. Vista Point is a short loop trail that goes to - you guessed it! - Vista Point. There is a parking lot and picnic tables at the trailhead. Picnicking - There are picnic facilities at a number of the pull-off locations: Vista Point, Goat Rock Beach, Wright’s Beach, Duncans Landing, Rock Point, South Salmon Creek Beach, and Bodega Head. These are day use areas and are can be used from 8 A.M. to sunset. Pets - The park is not pet friendly. Many of the beaches provide habitat for endangered species and do not allow dogs. They are also not allowed on any of the trails. In places where dogs are allowed (I guess this leaves the parking lots!) they must be kept on a 6 foot or less leash. Fishing and Boating - Access to the ocean, Bodega Bay, and the mouths of a few large rivers means there are plenty of opportunities for fishing in Sonoma Coast State Park. Common species of fish that anglers regularly pursue include rockfish, perch, salmon, steelhead and smelt. Red abalone, mussels and cockles are also collected along this section of the coast. A valid California sport fishing license is required and of course you must adhere to the fishing regulations. There are a few boat ramps in Bodega Bay. Westside Park is adjacent to the Spud Point Marina. You have to pay a $6 parking fee. There is also a boat launch at Doran Park. A $6 parking fee allows you to use the boat ramp. Wildlife - Bodega head is a great place to see migrating whales. They can be spotted from early December through mid February when they are heading south for calving season and on their northern return trip in March and April. Goat Rock Beach hosts a colony of harbor seals. March through June you can see newborn pups. The seals are fun to watch but do respect the fact they are wild animals. You should keep at least 50 feet away from them. Accessibility - the state park's website includes a page that details the facilities and amenities that are available.